Are your patients' electronic medical records safe? HIPAA compliance isn't just the law, it's good business. Whether you're a doctor, hospital, medical billing or other third-party medical service provider, if you aren't taking every precaution to safeguard that information, you could be jeopardizing protected health information (PHI) and patient financial information. 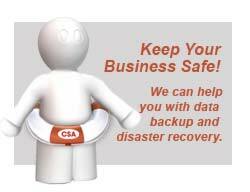 Be sure their data is safe by letting the technology experts at Computer Service Authority help you conduct an internal audit of your information security program. If we find any gaps in your system, we can help you fix it. HIPAA requires that healthcare providers and other covered companies strengthen their safeguards for PHI, ensure electronic information is exchanged securely, and establish a way to safely operate between systems (both within their company and between third-party providers like medical billing services). The penalties for a HIPAA violation are steep, with a possible prison sentence of up to 10 years and hundreds of thousands of dollars in criminal and civil fines per violation. (see the chart below for details). Get your information technology audit now from the HIPAA technology experts at Computer Service Authority. Failure to comply with HIPAA rules and regulations can result in hefty fines and in some cases, criminal prosecution. Detailed information regarding HIPAA violations and enforcement is available here. Listed below are some helpful resources regarding HIPAA, from the U.S. Department of Health & Human Services.